working in adult social, says the RCN. Investment – rather than merely 'good PR' – is needed to make adult social care an attractive career, the RCN said in response to a new recruitment campaign. The Department of Health and Social Care (DH) recruitment drive announced today aims to fill 110,000 vacancies in adult social care in England. It particularly wants to encourage people aged 20 to 39 into jobs as care workers, activities coordinators, personal assistants and occupational therapists. The DH said research suggests this age group is most likely to consider a job in the sector in the coming year. 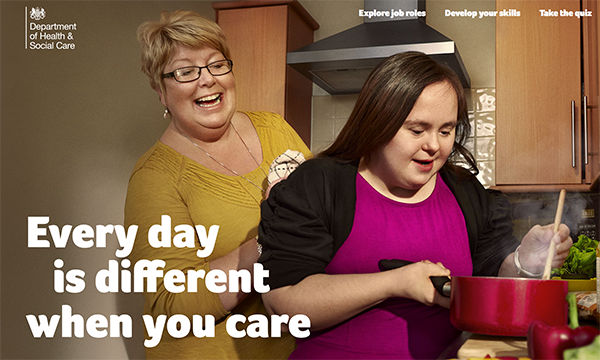 More than 1.45 million people work in the adult social care sector and roles include supporting older people or those with a physical disability, autism, dementia or a mental health condition. It is predicted an additional 650,000 workers will be needed by 2035 to keep up with the rising numbers of people aged 65 and over. RCN acting general secretary Dame Donna Kinnair said social care offered 'a varied and rewarding career' for those with an interest in caring for others, but criticised a lack of long-term investment in the sector. 'Those working in social care already will tell you that making it more of an attractive place to work requires hard cash investment as well as good PR. 'Registered nurses and care workers tell us they entered the sector with high hopes but in reality poorer pay than the NHS, low morale and precarious contracts led to them looking elsewhere.